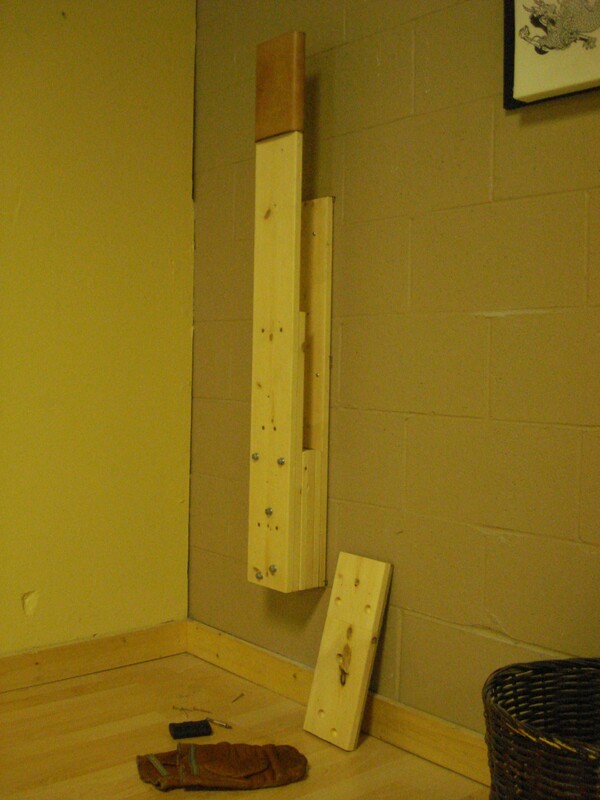 I recently built & installed your makiwara assembly in our aikido dojo to help us learn to punch more authentically. 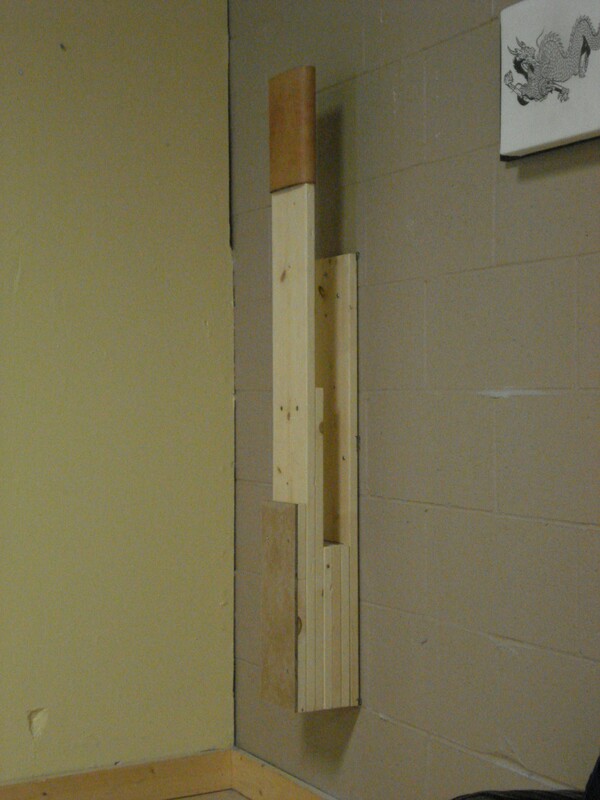 Since I had to anchor it to a cement block wall, I decided that using screws to anchor the boards might not be strong enough. Instead I used stove bolts which you can see in the photo where I removed the cover plate. Basically, the wall board is screwed into the masonry anchors (#12 x 2.5″ screws) after first inserting the stove bolts so they face outwards. BTW, drilling masonry requires patience and knowledge that if you hit something stronger than the bit, just drill another hole. Then each spacer board and the striking board assembly are jiggled onto the bolts which are then tightened with the nuts and thereby secure all boards as one unit. The cover plate just protects the users legs from the ends of the bolts and it looks nicer. I also DS taped an old Microsoft mouse pad and then stapled some scrap leather to the top of the striking board instead of the traditional sisal. So far, sensei skinned his knuckles on the leather already, and I loaned him my daddy’s old bag gloves, but my hands are tougher than his and the leather seems just right as long as I strike properly. I built your project because our sensei commented that it would be cool to have, but also because I want to build your accelerometer to get me back into electronics. Thanks for taking the time to document this project. Yes, you may post the pix and these comments. This entry was posted on March 9, 2011 at 9:24 am and is filed under makiwara. You can follow any responses to this entry through the RSS 2.0 feed. You can leave a response, or trackback from your own site.